Welcome to the Artistic Outpost Design Team Blog Hop! 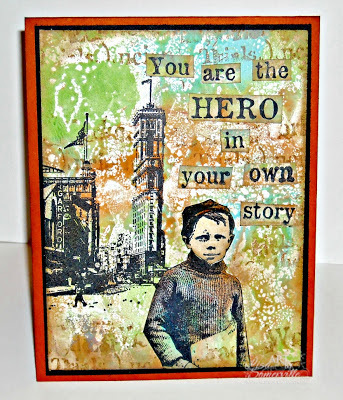 Each month, the fabulous designers at Artistic Outpost showcase projects created with various Artistic Outpost Plates/Themes, this months DT Blog Hop theme is Masculine. I created the background of my card using the Gelli Arts Plate, Ranger Distress Paints (Mowed Grass, Rusty Hinge and Broken China), and a stencil from The Crafters Workshop. Once the background was dry, I stamped the building in Black Archival, the text in Ranger Gathered Twigs Distress Ink, and the boy and sentiment onto scrap background pieces in Black Archival. The boy is colored with STAEDTLER Karat Aquarell Watercolor pencils, blending with Gamsol. Love your background and the paperboy image is handsome. Cool card! 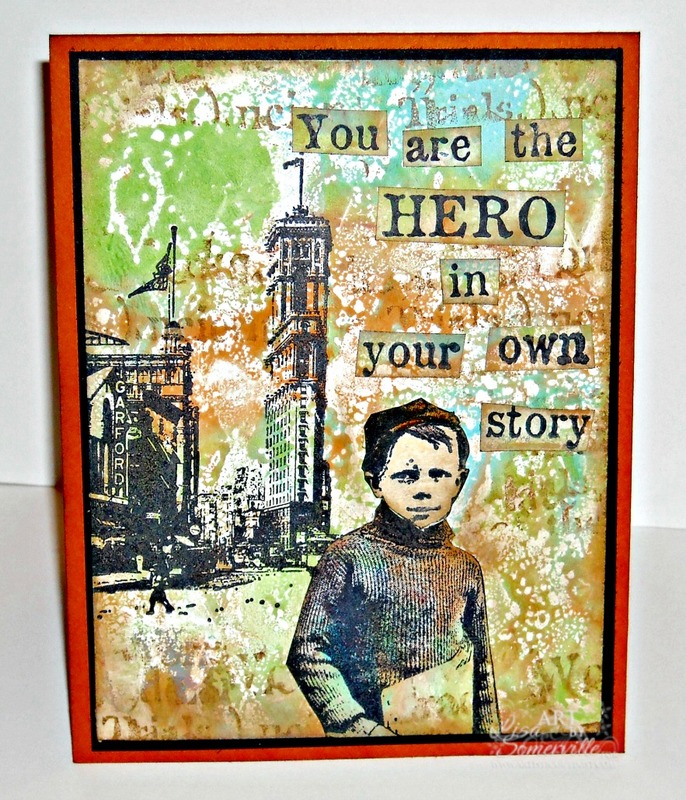 Woohoo loooove the background, those gelli plates create some fantastic stuff, thanks for sharing and have a wonderful day..
What a fantastic gelli print - and the paperboy looks fab against it! Lisa, love that vibrant background you created for the paperboy! Very cool! That background is GORGEOUS! Great project, Lisa! Wonderful card. Love the background you created. I am going to have to look into these gelli art plates. They are not in my local stores, so I will explore online. I am very interested after seeing all the great backgrounds you create. Thank you for sharing! Great collageie, artsy fartsy piece, love the colors. That background is amazing, really gorgeous colors and patterns. You are such an ace with the gelli plates. Terrific work with that awesome Paperboy plate! I love your gelli plate backgrounds. They create such great texture and color. A great back drop for paperboy. Love it! Love this card! You've gotten that gelli plate down perfectly! Oh that background! Simply amazing color and the patterns you achieved with the gelli plate are fab! Wonderful design with the AO images...love the color too! Wow Lisa..love the dimension and color.."it speaks to me" somehow..
this blog hop has really exciting work. These gelli plate backgrounds look amazing!! !